There's an Old West feel to Breckenridge, Colorado, an air of authenticity underscored by tours of gold mines and visits to historic saloons on Main Street. However, it's the town's renown as a top destination for skiing that provides the biggest draw for visitors. Check out some of the idyllic retreats and resorts in the area. A luxury resort nestled among a sprinkling of trees, this rustic retreat is located within two blocks of main street. You'll enjoy relaxing in an atmosphere consisting of large fireplaces, antler chandeliers, and polished wood surfaces. There are two fitness rooms, outdoor grills, an outdoor heated pool, and five hot tubs. Your quick access to the slopes is taken care of by the nearby BreakConnect Gondola. This amazing facility lays at the base of Peak 8, offering ski-in and ski-out accessibility that pairs perfectly with the elegance of luxury accommodation. Amenities include a sauna, indoor and outdoor hot tubs, a beautiful pool that shows glass-walled views of the mountains, and all the fun of a bowling alley. 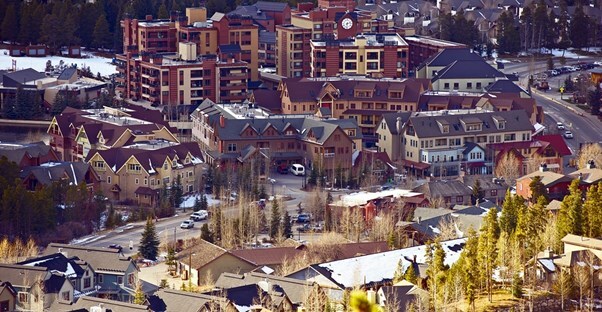 Features unique to the resort include The One Club ski valet service and a luxury private theater. A fairy tale orange glow from the paneled windows is reflected by the theme within your next destination, with rustic browns radiating from the wood accents. Even the surface of the pool table is shaded orange, as are the plush leather chairs and sofas. Again, ski-in and ski-out access, this time at the base of Peak 7, delivers excited skiers to the slopes within minutes. Amenities include underground parking, hot tubs, and access to the amenities at One Ski Hill Place. As the name indicates, this facility is located at the base of Peak 7, steps away from the Gondola. Spacious hallways and warmly-appointed lobbies greet visitors as the friendly staff guide you to your room. The amenities include an array of features that target fitness and comfort, including the Soothe Spa, heated pools, an adults-only grotto, and delicious food in the Sevens Restaurant. Ski racks and ski-in/ski-out convenience provide access to outdoor activities, while the aquatics center, two movie theaters, and a state-of-the-art fitness center take care of your body. Delivering rustic charm wrapped inside a modern package, the Bluesky defines elegant mountain living. Water features surround the facility, and the interior is a blend of wood and granite. The Southwestern theme elegantly matches the look and feel of Main Street, but it's the amenities and accommodation that impress most of all. A sauna, a relaxing spa, and a large kids activity area compete for your attention with a workout center and the chic CU Lounge bar. Located a few blocks from Main Street, you can visit a gallery or a cozy restaurant before returning to your well-appointed room to catch up on some sleep before hitting the slopes again.